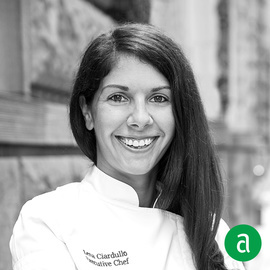 Lena Ciardullo, Executive Chef of Marta, Caffe Marchio, and Vini e Fritti in New York City, shares her career timeline and advice for up-and-coming talent. Food runs in my family: I grew up loving cooking, my aunts on both sides of the family were amazing cooks and I would teach myself family recipes. Later when I was in college, I studied abroad in Rome and found myself exploring the city in a way that was different from the other students. All of my choices had to do with food. Rome made me realize how unique my passion for food was, so during my senior year of college I got a job at a restaurant. I loved everything about it, from plating the food to scrubbing the flattops, and haven't looked back since. Put out the best work you can because you're doing it for yourself, not for me or anyone else: the idea of pride and ownership helps to form anybody from line cook to sous chef to executive chef. Having a hospitality-centered mindset and being detail-oriented are the most important skills to possess. We have to do consistent quality work to do our best to please our guests. Union Square Hospitality Group really invests in growing leaders. There are so many resources available for upward mobility and professional growth: to be able to grow in a company that is successfully growing is an enormous asset. It sets up people for success. I am only as good as my team, they are the backbone of the business. I would not be able to do my job without their support. Maialino, my first job in New York, really resonated with me because it’s an Italian trattoria, I’m half-Italian from my father. My grandfather worked in one of the Meatpacking factories in Chicago and my grandmother worked in a bakery. As part of the opening team, I saw food I’d cherished my whole life be elevated as we were setting up a restaurant. I was able to work next to amazingly talented people and it has stuck with me throughout my career. When we hire, in Danny Meyer’s words, we look for the 51%: people who are engaged, interested and have a positive attitude. Learning the skills of cooking takes work. It’s repetitive and it’s definitely not as glamorous as what TV shows make it look like. We look for people who are interested in taking the time to learn. My team and I constantly discuss our growing industry – we share about what moves us when we eat out and what we can continue to do better. We also talk to our farmers and our suppliers to understand the full picture – we are so inspired by the work that they do. At Maialino and Marta, we have taken something that is an old tradition – Roman food – and have blended it with New York, seasonal ingredients and classic techniques. We shoot for a cuisine that feels elevated, yet rustic and homey. There’s a lack of pretension, it’s very soulful. Keeping a work-life balance in this industry can definitely be a challenge: You have to train yourself to have peace of mind when you are away by giving your best possible when you’re at work.